Residents continue to organize against the AB InBev-owned brewery. 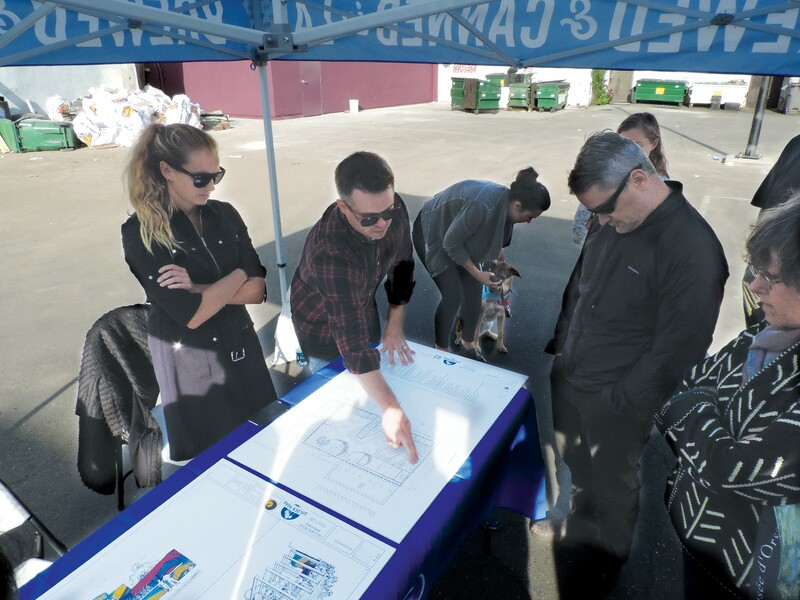 Meg Gill (far left) and her project manager (pointing) chats with curious neighbors last week at a meet-and-greet on the site of her proposed Golden Road beer garden in north Oakland. 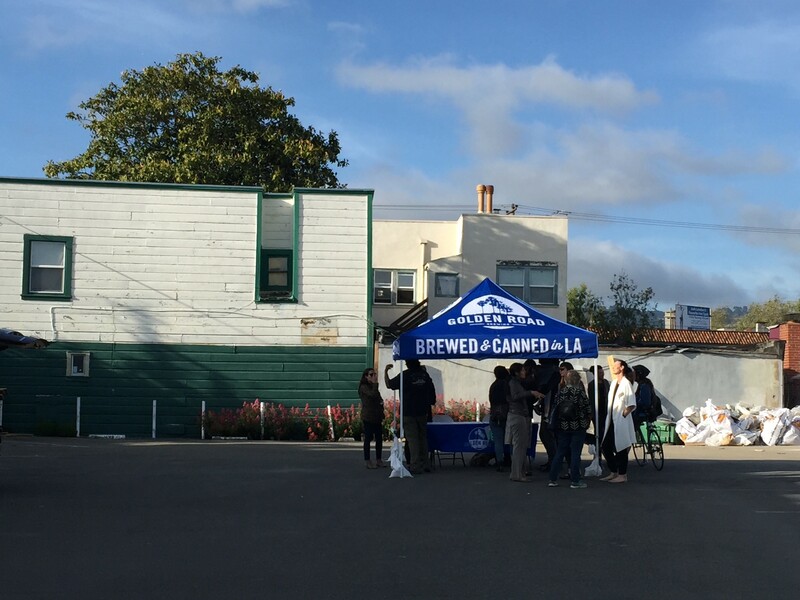 A Dodger-blue tent with the slogan “brewed and canned in L.A.” emblazoned on it popped-up on a vacant asphalt lot in North Oakland last week. Standing at a table underneath was Meg Gill, president of Golden Road Brewing, which she co-founded in 2011. Golden Road wants to open a satellite location on the 40th Street lot, just west of Broadway. Gill greeted neighbors and answered questions about the proposed beer garden and restaurant last Wednesday for nearly two hours. A few hundred feet away on the sidewalk, protestors set up their own table, with signs decrying Golden Road’s arrival. The opposition goes by the name Temescal Friends — but they’re not so friendly when it comes to Golden Road. In fact, they don’t even refer to the brewery by its name; they call it an Anheuser-Busch InBev business, since Golden Road was acquired by the corporate-beer powerhouse in the summer of 2015. For the past months, the activists have lobbied fellow neighbors and city leaders to stop Golden Road from building an outdoor beer garden in their proverbial backyard. Some might describe their concerns — noise, parking, traffic, drunks — as run-of-the-mill NIMBY worries. But a major reason they oppose the beer garden is because it will be owned by AB InBev, a huge conglomerate that they say is notorious for cutthroat business strategies. “All the businesses on 40th Street are locally owned, except the car wash across the street,” explained Diana Stasko, one of the activists, of her motivation. “The other businesses, the owners live in the community, and they want to be good neighbors” — her implication being that AB InBev doesn't care about Oakland. But Gill, who sat down for an interview with the Express last week, rejects the idea that Golden Road won’t be a positive addition to the neighborhood. She explained how she used to work in the Bay Area, at Speakeasy Ales & Lagers, and was an active member in the regional beer scene before moving to Los Angeles. “I’ve always wanted to come back. I’ve always wanted to do something creative but small, and be able to give our brewers a little playground to do that in. We’re not trying to do anything more than that” here in Oakland, Gill assured. The beer mogul — named by Forbes Magazine in 2014 as one of the 30 most promising entrepreneurs under age 30 in the country — spurns the idea that Golden Road, because it is owned by AB InBev, is, as critics say, a "fake" craft brewery. She also rejects the notion that Golden Road is somehow under the thumb of a so-called corporate overlord, Anheuser-Busch. “They have nothing to do with this,” Gill insisted. “Anheuser-Busch reads the articles [criticizing Golden Road] and they’re like, ‘What the hell’s going on in Oakland?’ This isn’t, like, a stake in the ground. There’s no market-share grab. Under the blue pop-up tent, Gill pointed at architectural designs and renderings of her proposed 7,000-square-foot Golden Road beer garden. The drawings revealed a blue, yellow, and fuchsia color scheme with a large, vibrant Golden Road sign at the entrance; and depicted ample outdoor seating, complete with fire pits and open spaces for games like over-sized Jenga. More than a dozen residents hovered around Gill and a project manager while asking questions, prying to learn more. Why should Oakland welcome AB InBev into the community? Gill’s adoptive Trump vernacular aside, it’s no secret that Golden Road’s arrival has been contentious precisely because of its association with AB InBev, complete with a bevy of misinformation on both sides, and inflammatory opinion pieces and blog posts by detractors (including — full disclosure — an editorial slamming AB InBev by the writer of this story). This same woman also asked Gill about workplace-safety violations at Golden Road. But, again, no dice: In 2013, the federal Occupational Safety and Health Administration fined an AB InBev-owned facility in Houston $88,000 for exposing workers to dangerous carbon dioxide, and similar OSHA citations have been levied against Anheuser-Busch facilities in Ohio in 2014 and Georgia in 2010. But there never have been workplace-safety fines or violations against Golden Road itself. Gill said she feels “abused” by these types of attacks against her brewery, including what she described as unfair criticism by the Express. “I think that your articles are abusive. I think that you’re incredibly discriminatory against a successful businesswoman who has done well, partnered with a big beer company, and is now wanting to build in Oakland, just like Rare Barrel or any of these other guys,” she explained. Of course, critics counter by arguing that Anheuser-Busch and InBev deserve it, because the conglomerate boasts a legacy of what they describe as predatory business practices. Sayre Piotrkowski, for instance, has worked in the Bay Area beer industry for more than a decade, and has been a vocal opponent of Golden Road’s Oakland plans. The erstwhile beer blogger even wrote a lengthy letter to the Temescal Telegraph Business Improvement District, which represents neighborhood property owners, suggesting that the brewery “would have a profoundly negative short and long-term impact” on nearby businesses. In his letter, Piotrkowski reminded that “ABInBev is the largest beer conglomerate in the world” and that it has “a long, documented history of unethical and hostile business practice." The business district's executive director said his letter sparked a healthy dialogue among board members, who eventually voted not to recommend the project to the City of Oakland, and instead remained neutral. But Piotrkowski and others opposed to Golden Road also say that the brewery itself is a major influencer in AB InBev’s “high end” craft-beer sector — and therefore responsible for corporate decisions that hurt independent and locally owned breweries and businesses. Anheuser-Busch responded to Alvarado and other local brewer’s complaints, however, by stating that lower hop yields were responsible for the decision to cut-off non-AB InBev breweries from the South African harvest. The Golden Road gathering last Wednesday grew more heated as its end neared. For instance, just before 7 p.m., one man chastised the brewery for allegedly polluting the Los Angeles River and Pacific Ocean — a claim that is also not accurate. The man’s accusation stems from a recent stormwater-permit inspection at Golden Road’s flagship facility. On May 4, the Los Angeles Regional Water Quality Control Board denied Golden Road’s stormwater certification. A spokesman with the board told the Express that the brewery will be receiving a letter of non-compliance, and also will need to enroll in a different industrial stormwater-monitoring program. During a Water Quality Control Board visit to Golden Road in April, two inspectors documented and photographed spent-grain from the brewing process out in the open, plus trash and recyclables, liquids, and other contaminants that could be exposed to rain and flush into nearby streams. Golden Road was not fined or issued a citation by the agency. And a Golden Road manager told the Express that there’s zero chance any waterways were contaminated, explaining that the brewery has strict environmental-safety practices, and that the permit matter is just a "paperwork" issue. According to the Water Quality Control Board, now Golden Road might be required to sample stormwater that leaves the brewery, make visual observations of any stormwater discharges and report them to the agency on a quarterly basis, or draft and implement a stormwater-pollution prevention plan. As of May 11, the L.A. Water Quality Control Board had inspected 54 industrial facilities in the same "No Exposure Certification" program as Golden Road this year. Only four of these facilities were denied certification, including Golden Road. Back in Oakland, Golden Road will soon be submitting an updated application to city planners in hopes of gaining approval for its 40th Street beer garden. After vociferous feedback from neighbors, the beer garden's project manager said he will be reconfiguring and tweaking its layout and design in hopes to minimize residential impacts. Golden Road’s beer garden and restaurant would make this asphalt lot on 40th Street its home. But Diana Stasko, who lives “within an earshot” of the proposed location, says she’s worried that Golden Road isn’t hearing the neighborhood’s concerns. “I thought that they were remarkably ill-prepared for our questions” at last week's meet-and-greet, she said. It’s flippant to dismiss neighborhood concerns as pure NIMBYism. For instance, Golden Road is asking for a parking-spot waiver for the beer garden, meaning patrons will fill street parking spots — and it's is already nearly impossible to find one in the area, residents say. Concerns over the over-saturation of alcohol establishments are valid; there are numerous restaurants and bars that serve alcohol in the Temescal-Telegraph district. And many view Golden Road as yet another gentrifying force — out-of-towners parachuting into town simply to cash in on Oakland's trendiness and tech-worker, market-rate condo-clientele — which could siphon dollars away from competing, locally owned businesses such as Hog’s Apothecary, Temescal Brewing, and Drake’s Dealership. The Temescal Friends activists are demanding that the city not grant Golden Road’s requested five-parking-spot waiver, and not allow the brewery to operate until 1-2 a.m., as planned. So far, Stasko says that the coalition has 25 active members, and that more than 375 individuals have signed an online petition opposing Golden Road in Oakland. This opposition has Gill surprised. She recently visited the East Bay to highlight a Berkeley-based Queers Making Beers group for her Beerland TV show on Vice’s cable network, and in general feels as if she has roots here. “Maybe I have a misunderstanding since I left the Bay Area, but I thought … ‘People are going to love this, people are going to be excited that we’re coming back to the Bay Area,’” she said.